Arbil (Iraq) (AFP) - Iraqi forces battled on Sunday through booby-traps, sniper fire and suicide car bombs to tighten the noose around Mosul, while also hunting Islamic State group jihadists behind attacks elsewhere in the country. Kurdish forces announced a new push at dawn on Bashiqa, northeast of Mosul, where some 10,000 fighters are engaged in a huge assault to take the IS-held town. Turkey's Prime Minister Binali Yildirim said the peshmerga had requested and received Turkish military assistance. "They (Peshmerga) asked for help from our soldiers at Bashiqa base. We are providing support with artillery, tanks and howitzers," Yildirim told reporters in western Turkey on Sunday. Ankara's claim came a day after Baghdad turned down a suggestion by visiting US Defence chief Ashton Carter -- who met Kurdish leader Massud Barzani on Sunday -- that Turkey be given a part in the battle. 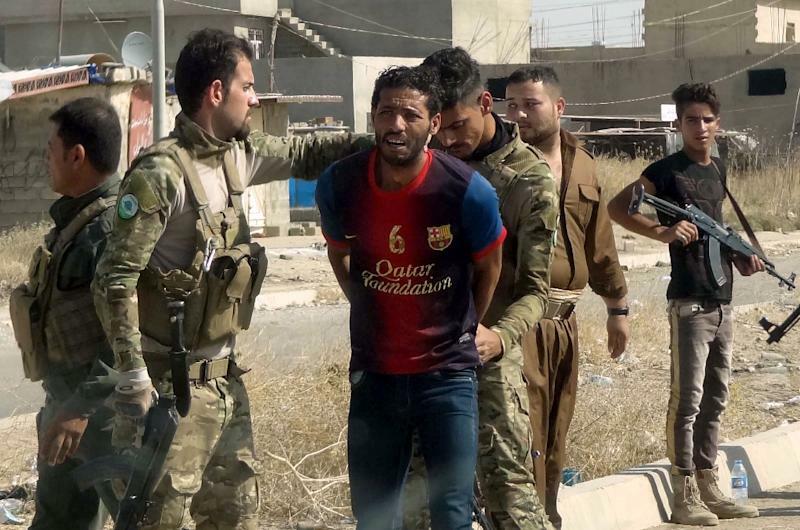 Launched last Monday, the assault aims to reclaim the last major Iraqi city under IS control, dealing another setback to the jihadists' self-declared "caliphate" in Iraq and neighbouring Syria. Carter said on Sunday that the idea of simultaneous operations against Mosul and Raqa in Syria "has been part of our planning for quite a while". He also said destroying IS's external operations capabilities was "our highest priority". The jihadists on Friday staged a surprise assault on Iraq's Kurdish-controlled city of Kirkuk, and two days later security forces were still tracking down IS fighters there. The dozens of attackers, including several suicide bombers, failed to seize key government buildings but sowed chaos in the large oil-rich and ethnically mixed city. At least 51 of the jihadists have been killed, including three more on Sunday, local security officials said. At least 46 people, most of them in the security forces, were also killed in the raid and ensuing clashes, which had almost completely ceased by late Sunday. Life was returning to normal in some parts of Kirkuk, but security forces in southern neighbourhoods were still hunting for several gunmen. IS also attacked Rutba, a remote town near the Jordanian border in the western province of Anbar, with five suicide car bombs, the area's top army commander said on Sunday. The attackers briefly seized the mayor's office but security forces quickly regained the upper hand, he said. The spectacular attack in Kirkuk, of a type observers warned could happen more often as IS loses territory and reverts to a traditional insurgency, temporarily drew attention away from Mosul. But there was no sign it had any significant impact on the offensive to retake the city, Iraq's largest military operation in years. 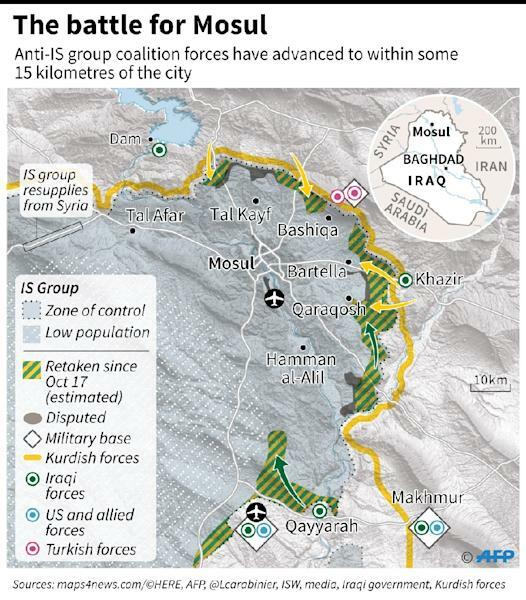 Tens of thousands of fighters, including Iraqi federal troops and Kurdish peshmerga, are taking part in the assault. Engaged on the northern and eastern fronts, the peshmerga are expected to stop along a line at an average of 20 kilometres (12 miles) from the boundaries of the city proper. "They are pretty much there," a US military official said on Saturday, adding that the lines "will be solidified in the next day or two". The peshmerga announced they had secured eight villages near Bashiqa, an IS-held town northeast of Mosul and one of the main Kurdish targets in the offensive. Elite federal forces were also fighting to retake control of Qaraqosh just east of Mosul. It used to be Iraq's largest Christian town. Lieutenant General Stephen Townsend, commander of the US-led coalition, said Saturday that jihadist resistance was stiff. "It's pretty significant, we are talking about enemy indirect fire, multiple IEDs (improvised explosive devices), multiple VBIED (vehicle-borne IEDs) each day, even some anti-tank guided missiles," he said in Baghdad. Iraqi Kurdish and federal forces rarely release casualty figures, but hospitals behind Kurdish lines were overwhelmed by the number of wounded, an AFP reporter said. "We have a shortage of human resources, medical equipment, medicine and specialised doctors," Lawand Meran, a doctor at Arbil West hospital, said. "Soon, if we have 1,000 casualties, our capacity will not be enough." US military officials have revised their estimate slightly upward for the number of IS fighters in and around Mosul. They believe IS is defending Mosul, where the "caliphate" was proclaimed in June 2014, with 3,000 to 5,000 fighters inside the city and 1,000 to 2,000 in the outskirts. There is deep concern for an estimated 1.2 million civilians still believed to be in the city. Several thousand civilians fleeing the fighting and the jihadists who ruled them for two years have escaped to camps for the displaced south of Mosul. "Over 5,000 people are currently displaced and in need of humanitarian assistance," the United Nations said in an update on Sunday. "Population movements are fluctuating as the front lines move, including people returning to their homes following improved security conditions in the immediate area," it said in a statement. 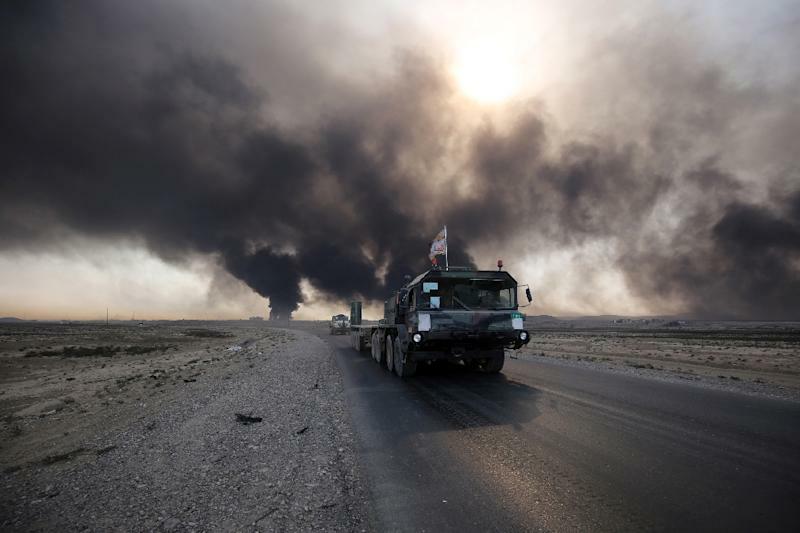 Iraqi forces are now fighting in sparsely populated areas but when they near the limits of the city itself aid groups fear the start of a huge exodus. A million people could be displaced, sparking an unprecedented humanitarian emergency in a country where more than three million people have already been forced from their homes since the start of 2014.